Congratulations! You have been invited to the bar or bat mitzvah of a friend or family member. Now what? Knowing what to expect ahead of time will ensure that your experience is a comfortable and positive one. While this article focuses on what to wear and do — and some of the rituals you will see — we recommend you also consult our Guided Tour of the Synagogue and Highlights of Shabbat Morning Worship. Keep in mind that services (and service lengths) vary widely from congregation to congregation, depending on a synagogue’s denomination (Orthodox, Conservative, Reform etc. ), its leadership and its unique customs or traditions. To learn more about the particular synagogue you will attend, you may want to consult its website or ask the bar/bat mitzvah host. In addition, while the majority of bar/bat mitzvah ceremonies take place during Shabbat morning services and at synagogue, as described below, some are on Friday night or Saturday afternoon. It is also increasingly common for families to host private bar/bat mitzvah ceremonies that take place outside synagogue. 1. Dress: Guests at a bar/bat mitzvah celebration generally wear dressy clothes — for men, either a suit or slacks, tie, and jacket, and for women, a dress or formal pantsuit. In more traditional communities, clothing tends to be dressier; women wear hats and are discouraged from wearing pants. 2. Arrival time: The time listed on the bar/bat mitzvah invitation is usually the official starting time for the weekly Shabbat, or Sabbath, service. Family and invited guests try to arrive at the beginning, even though the bar/bat mitzvah activities occur somewhat later in the service; however, both guests and regular congregants often arrive late, well after services have begun. 3. Prayer shawl: The tallit (tall-EET or TALL-is), or prayer shawl, is traditionally worn by Jewish males and, in liberal congregations, by Jewish women as well. 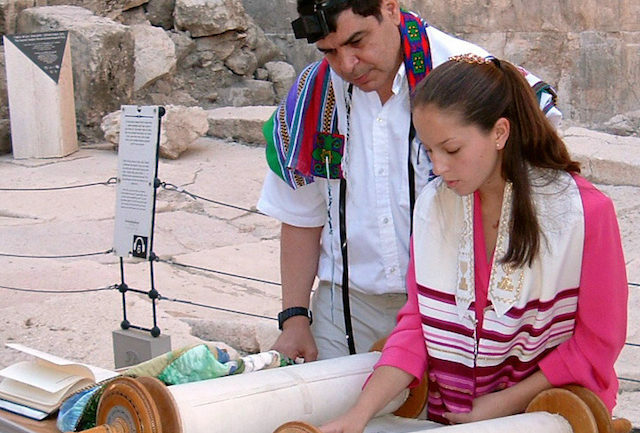 Because the braided fringes at the four corners of the tallit remind its wearer to observe the commandments of Judaism, wearing a tallit is reserved for Jews. Although an usher may offer you a tallit at the door, you may decline it if you are not Jewish or are simply uncomfortable wearing such a garment. A basket of custom-stitched yarmulkes. 4. Kippah, or yarmulke: A kippah (KEEP-ah) or head covering (called a yarmulke in Yiddish), is traditionally worn by males during the service and also by women in more liberal synagogues. Wearing a kippah is not a symbol of religious identification like the tallit, but is rather an act of respect to God and the sacredness of the worship space. Just as men and women may be asked to remove their hats in the church, or remove their shoes before entering a mosque, wearing a head covering is a non-denominational act of showing respect. In some synagogues, women may wear hats or a lace head covering. 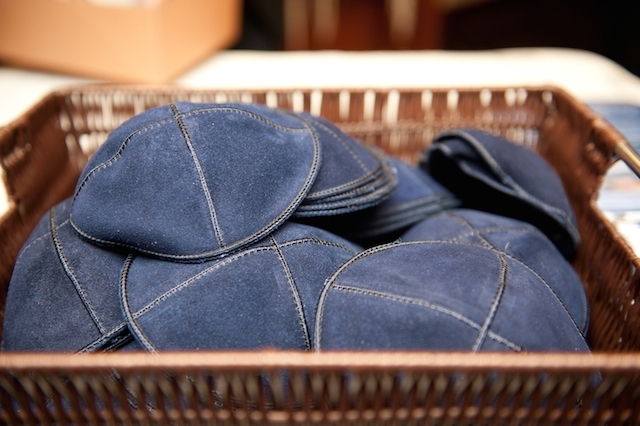 Most synagogues have a basket of kippahs (also called kippot) at the entry to the sanctuary, and bar/bat mitzvah hosts often provide custom-made ones that you can keep as a memento. Setting your cell phone or beeper to vibrate or turning it off. Not taking pictures. Many families hire photographers or videographers and would be pleased to take your order for a photo or video memento. In traditional settings, photography is strictly forbidden on Shabbat. Not smoking in the sanctuary, inside the building, or even on the synagogue grounds. Not speaking during services. While you may see others around you chatting quietly–or even loudly–be aware that some synagogues consider this a breach of decorum. 6. Sitting and standing: Jewish worship services can be very athletic, filled with frequent directions to stand for particular prayers and sit for others. Take your cue from the other worshippers or the rabbi’s instructions. Unlike kneeling in a Catholic worship service–which is a unique prayer posture filled with religious significance–standing and sitting in a Jewish service does not constitute any affirmation of religious belief, it is merely a sign of respect. There may also be instructions to bow at certain parts of the service, and because a bow or prostration is a religiously significant act, feel free to remain standing or sitting as you wish at that point. 7. Following along in the prayerbook: Try to follow the service in the siddur, or prayerbook, and the chumash, or Bible, both of which are usually printed in Hebrew and English. Guests and congregants are encouraged to hum along during congregational melodies and to participate in the service to the extent that they feel comfortable. If you lose the page, you may quietly ask a neighbor for help (although it is better not to interrupt someone in the middle of a prayer). During the Torah service (described below), the entire congregation is encouraged to follow the reading of the weekly Torah portion in English or Hebrew. 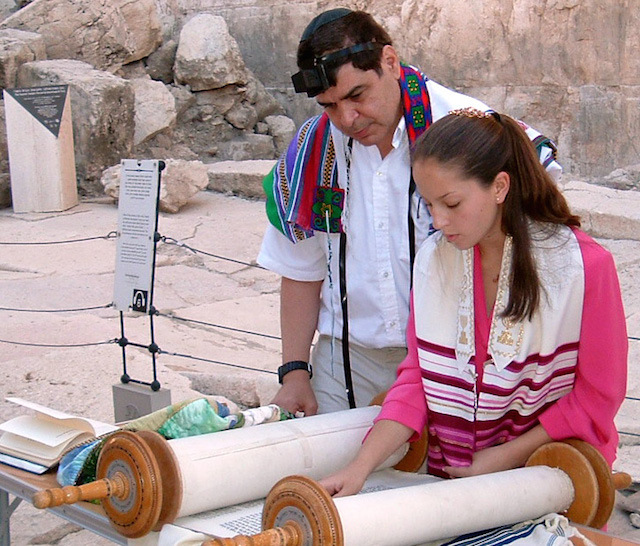 What Does the Bar/Bat Mitzvah Celebrant Do? At 13, a young Jewish man or woman becomes obligated to observe the commandments of Judaism. “Bar/bat mitzvah” literally means “son/daughter of the commandments.” The celebration of a bar/bat mitzvah signifies that the young man or woman is beginning and will continue to function as an active and responsible Jew in the synagogue and in the wider Jewish community. The bar/bat mitzvah child will participate in the Shabbat service in a variety of ways, depending on the congregation’s customs. The bar/bat mitzvah may do some or all of the following: lead prayers, read (often chanting) from the Torah and/or Haftarah, deliver a dvar Torah — a speech about the Torah portion read that day. Family members are usually honored by being called up to say a blessing over (or read from) the Torah, and the bar/bat mitzvah child’s parents often deliver a speech. Shabbat morning services are usually followed by a kiddush, or light meal, in the synagogue’s social hall or other space outside the sanctuary. The kiddush gets its name from the blessing over wine that is recited just before the meal. Often bar/bat mitzvah guests are invited to a separate party, either immediately after the service or that evening. (Traditional Jews will not have a party until after sundown, because they are not permitted to drive or play music on Shabbat.) Parties take place in a variety of venues, ranging from the synagogue’s social hall or ballroom to restaurants or large event halls. Most include a meal and dancing, during which the bar/bat mitzvah child is sometimes raised on a chair. Like wedding receptions, bar/bat mitzvah parties vary widely in scale and expense: Some provide modest buffet meals, while others are lavish, multi-course affairs with waiters and waitresses. Often the bar/bat mitzvah child chooses a theme and special centerpieces for the party. Many bar/bat mitzvah parties have band or hired deejays, who in addition to providing music often lead games and activities. A popular feature at bar/bat mitzvah parties is the candle-lighting ceremony, in which the bar/bat mitzvah child lights a series of candles, choosing to honor different friends and family members with each candle. It is customary for invited guests to give a gift to the bar/bat mitzvah celebrant. Presents are best delivered at the party or reception, rather than at the synagogue service. Most parties feature a gift table or other place designated for gifts. For gift suggestions, click here. To read this article, “What a Bar/Bat Mitzvah Guest Needs to Know,” in Spanish (lee en Español), click here. Pronounced: KEE-pah or kee-PAH, Origin: Hebrew, a small hat or head covering that Orthodox Jewish men wear every day, and that other Jews wear when studying, praying or entering a sacred space. Also known as a yarmulke. Parents, educators, rabbi, and student must work as a team to adjust the ceremony to the student's learning style and capabilities.